No matter how big or small your job, our highly trained electricians have got the skills to get the job done. Our licensed electricians can install and repair data and phone lines or outlets for your home or business. Get your home or business system installed, repaired or serviced by Perth’s air conditioning specialists. Save money on your power bills and reduce your carbon footprint with expertly installed solar panels. When the unexpected occurs, you can be sure you’re in good hands with our 24/7 electrical service. Got something else in mind? Our fully qualified electricians have years of experience and are ready to help. Need an electrician in Perth you can count on? At Richtek you can expect superior electrical solutions not quick fixes. We service all areas of Perth from as far north as Yanchep to Bunbury in the south and Perth Hills to the east. Our team of highly skilled electricians have extensive experience across residential commercial and industrial electrical work, so no matter how complex or straightforward your job is – we’ve got you covered. Unlike the typical tradies you may have come across in the past, we’ll make sure we arrive on time, explain the different options available to you and clean up after the work is done. We don’t cut corners and take safety seriously. We follow through with safety procedures for every job, to ensure the safety of our customers and staff at all times. We believe in providing the best value for money for the highest quality service. With our upfront fixed pricing, you’ll pay for the job not by the hour, and we make sure you are 100% satisfied with the quality of our work before we leave your property. Whether you require a new power point or rewiring from scratch, we have the experience to take care of all of your home electrical installations, maintenance and repairs. We invest in the latest electrical and lighting technology, so that we can offer you the best energy efficient solutions for your electrical needs. When you need a commercial electrician in Perth that’s equipped to handle anything from small business fit-outs right through to large scale industrial projects, call Richtek. We pride ourselves on our efficient, high quality workmanship and commitment to customer satisfaction. We can also provide a range of comprehensive testing and maintenance solutions, to ensure all of your electrical assets are properly maintained, and above all consider the safety of your staff. We understand electrical emergencies don’t always happen between 9 to 5, which is why we provide residents and businesses with a 24 hour emergency call out service every day of the year. For all your electrical needs, give Perth’s most trusted electrical specialists at Richtek a call today on (08) 9375 3926 or request a free online quote. 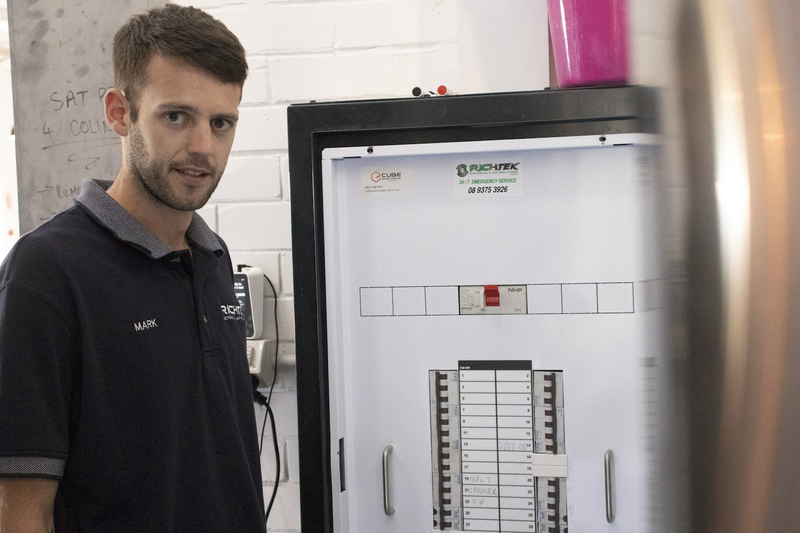 From office set ups to your home phone line or data cable installation and repairs, our team of Perth electrical specialists can get you connected, ensuring your system is running smoothly from the get go. These days we all rely on our smart devices and security systems to work effectively, so when something does go wrong you’ll want a qualified technician to look at your phone line and data connection as quickly and efficiently as possible. At Richtek, our skilled electricians have extensive experience in phone and data cabling systems. From installing a new line or cables, repairing an old one, or relocating an existing line, we’ll make sure your wiring is installed correctly and enable superior data connectivity based on your network requirements. We understand how disruptive a job like this can be, which is why we look closely at your property before we even begin. With a solid installation plan in place, we’ll minimise any disturbance and downtime, so you can rest assured of a job well done! We avoid drilling too many holes and ensure the wiring is very discreet, without leaving any data cables in open view. We use high performance cables in all our installations and repairs designed with longevity in mind, so you never have to worry about an unreliable connection. We provide comprehensive and customised data and phone solutions to suit your business’s needs now and into the future. Whether it’s a single point access or 100 point access to your phone or date lines, we’ll install a reliable and fast system according to your requirements. And if your system needs a complete overhaul, we can review everything and expertly repair or relocate your data and phone lines, to ensure you continue receiving uninterrupted phone and internet services. Ask about our affordable data cabling and phone line services today. Contact Perth’s electrical experts at Richtek on (08) 9375 3926 or request a free online quote. Whether you want to heat your property in winter, or keep it cool in summer, Richtek’s Perth air conditioning experts can handle it all. We specialise in ducted and split system installations, and we can also service and maintain your system as required. We work with all types of air conditioner brands for home and commercial purposes. Our friendly team of installers have years of experience and know how to put in the most complicated systems. Depending on your needs, we can advise you on the best system and placement to ensure maximum efficiency. Ducted air conditioning is a quiet and effective air conditioning system that can be installed throughout your entire home or office. Ducted air conditioners consist of an indoor and outdoor unit and a network of ducts. The indoor unit is usually located in the ceiling or under the floor, with flexible ducting distributing air flow to one room, multiple rooms or the whole home/ building via a series of vents. You can also monitor multiple zones by switching off rooms not in use. through a wall to a compressor located outside. An inside air conditioning outlet unit is hung on the wall in a specified room where you require heating or cooling. If you want to heat or cool multiple rooms, a multi split system will do the trick. It runs similar to a single split system with each room having its own dedicated wall unit, and they can all be connected to the same outdoor compressor. Regularly servicing your air conditioning system will ensure it maintains optimum performance and efficiency levels, while also increasing the longevity of the system. We recommend cleaning the filters once or twice a year and maintaining any grass or vegetation that may be situated near the outdoor fan or motor. Our technicians can also perform annual checks on your system, as over time it can degrade, which forces the unit to work harder to cool or heat your space. For all of your heating and cooling needs, speak to your local and experienced air conditioning experts at Richtek. Call us on (08) 9375 3926 or request a free online quote today. At Richtek Electrical, we provide a range of comprehensive solar power solutions for your home, commercial or industrial premises. With the constant rising cost of electricity, you could save substantially with a grid connected solar installation and start harnessing clean renewable energy from the sun. Living in Perth, there’s never any shortage of sunshine, so the potential to benefit from solar energy is huge. We have been installing solar systems since -insert year- , so you can be sure we have the experience to help you choose the best system. Before we begin, we’ll come out to your property and assess the viability of solar panels including your expected returns. Our qualified solar technicians will manage the entire project and installation. Speak to a Perth solar electrician at Richtek about solar panel installations for your property. Call us today on (08) 9375 3926 or request a free online quote. There’s never a good time to face a power failure or electrical outage. Being without power for hours can be very frustrating, which is why having a reliable Perth electrician nearby comes in handy when the unexpected occurs. If you’re in the Perth metropolitan area, you can rely on our 24 hour electrical emergency services any time of the day or night, 7 days a week. Our highly skilled electricians are on call to respond quickly to your home or business, with the aim of restoring power as quickly as possible, with minimal downtime. Have an electrical emergency? Call us now on (08) 9375 3926. As Perth’s leading electrical specialists, we have years of experience across a wide range of electrical services. We pride ourselves on being the best in the trade with our prompt, reliable service and the highest quality workmanship. We carry out our jobs for 100% customer satisfaction every time and we do it all with a smile. No matter how complex the job may be, we have the capabilities and passion to handle it all from start to finish. If you have something that needs installing, upgrading, fixing or replacing, call your friendly Perth electrician at Richtek today on (08) 9375 3926 or request a free online quote.